Publisher: Claude J. Pelletier, Ianvs Publications, Protoculture Enr, Protoculture, Christopher Macdonald, Protoculture, Inc. Note: Originally published on the “Anime Archivist” blog in June 2014. 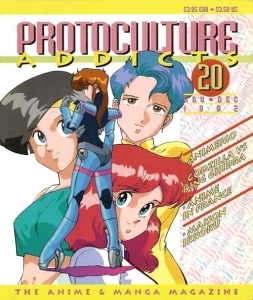 Protoculture Addicts felt like one of those magazines that seemed to be around since the dawn of time. I recall seeing the magazine at various comic book shops during the mid to late 1990’s, but for whatever reason I thought that it just didn’t seem to be worthwhile purchasing it, especially when I was already buying Anime FX (formerly Anime UK), Manga Mania and Animerica. However when Anime FX fell off the perch and Animerica seemed to be overtly gunning for a general casual audience rather than the core fandom, I decided to pick it up. Despite the rather lacklustre design, I was rather surprised at the depth of the articles and how it was overflowing with information and data. I became a devoted reader. Once I had acquired a few back issues, I realised the magazine wasn’t always like this. Starting as a number zero test issue in Autumn 1987, then the first true debut issue in Spring 1988, it was through and through a “Robotech” fanzine. Based in Canadian city of Montréal, Quebec, it was started by three French Canadians; Claude J. Pelletier, Alain Dubreuil and Michel Gareau. From 1988 to the end of 1991, the magazine was published in comic book formats, black and white, 36 pages long, typically in a bimonthly schedule. 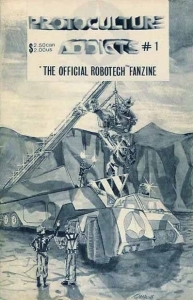 While the first seven issues (to April 1990) had the by-line “The Official Robotech Fanzine” on the cover, there was absolutely no evidence in the magazine or its credits to show that this was the case. However I was advised by one of the former writers that did indeed have a licensing agreement with Harmony Gold. Certainly the word “fanzine” was never in dispute. The early issues are amateurish as hell. Regular columns in the initial issues included “Robotech Trivia”, “Uh?! The Chronicle and the Bizarre & Odd in Robotech” (named because of the overuse of “Uh” by characters in “Robotech”), information on Robotech RPGs and news on the franchise. The layout looked pretty awful (a lot worse than Anime-zine and Animag, whose layouts were mediocre at times) and the writing was quite “fanish”, naïve and ignorant, certainly in comparison to the other anime magazines being published at the time. For example Pelletier’s article on “Japanimation” in issue 2 really highlights the fact he practically knows nothing about the subject outside whatever what was available on TV or in local video stores (again, compare with the contents of Anime-zine and Animag). Other articles included an utterly fanboyish series on making an actual Macross Valkyrie and a truly horrible comic called “Operation Aborted”. The story, and I kid you not, involves a female veritech pilot who is considering an abortion. Her pilot boyfriend is killed in a battle with Zentradi and she decides to keep it. Obviously Christian right wingers wrote comics for the magazine. At any rate, it’s a comic that’s just so horrible in so many ways, including artwork. By issue 8 (April 1990), things were changing. The “Official Robotech Fanzine” by-line had disappeared from the magazine’s masthead and anime other than “Robotech” related material had started to appear on the covers as well as in the articles. 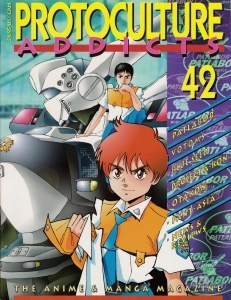 The letters section show there was a minor backlash to the format change, but as Pelletier rightly pointed out in some of the first issues, Robotech’s popularity was on a downward swing. The only way for the magazine to be truly viable was to expand out into the wide world of Japanese animation. With issue 12 in 1991, the layout and design was given a much needed revamp. Over the next few issues, the magazine developed a content template which it would pretty much use until the final issue some 17 years later. The magazine now contained regular sections such as news and reviews, anime synopses, reports on conventions (and anime club info), regular in depth articles on Japanese live action titles as well some fan art and RPG material. While the writing and layout had improved dramatically, some of that cringe worthy fanboy stuff of early issues remained. A section called “Anime Gossips” was introduced which was fanboy humour at its most lame. Here’s a sample; “Thanks to the success of rock singer Priss with her layout in Easyriders magazine, the National Rife Assocation has chosen S.W.A.T. commando Deuan Knute to be the centrefold for their organization’s journal”. Yes, a whole page that junk was wasted for way too many issues. Eventually it was scraped around 1995 or so (I’m missing few issues from that era). Prior to their new layout and general change in direction, the magazine released a couple of specials. One was pretty mainstream; a full colour “Akira” poster/magazine (produced in conjunction with ex-Anime-zine staff), however the other caused some waves in the anime fandom community. Pelletier had noticed that many anime included shower and bath scenes. He decided to produce a rather tongue in cheek “Anime Shower” special. Produced in the same black and white comic book format as Protoculture Addicts, it featured still shots of anime girls having showers or baths. Toren Smith even wrote an article for the special which notes how mixed public baths were common place prior to WWII. While Toren acknowledges the voyeurism in these scenes in anime, he cheekily adds that it’s good that anime was sending a positive message to youth about personal hygiene and that his favourite shower scene is from episode 124 of “Urusei Yatsura”. Some of the fandom reaction was negative citing that the concept was sexist and exploitative. Yes, there were some seriously uptight fuckers in anime fandom even back in the early 1990’s. Regardless, two more “Shower Specials” were produced by the magazine with the final issue published in 1993. There also was a sister magazine published by Ianvs Publications from 1991 to 1995 called Mecha Press, however other than coming from the same publisher, it really was a separate magazine to Protoculture Addicts, so I won’t be dedicating any time to it. I only have two issues anyway so I currently have no plans to write about it as a separate blog post either. The first issue of 1992 saw Protoculture Addicts’ format expand to B5 size. Alain Dubreuil stepped down as editor and publisher Claude J. Pelletier took up the role. The US anime industry was in its infancy with AnimEigo, US Renditions, Streamline Pictures and U.S. Manga Corps all releasing titles every month (with a list of titles and release dates now regularly published in the magazine until it’s last issue). The magazine stated publishing semi-regular interviews, mostly with people connected with the North American side of things. People like comic book artist Ben Dunn and John O’Donnell of U.S. Manga Corps. Interestingly in the O’Donnell interview, the magazine stated that John was formally head of Sony Video Software, which explains the bulk of the company’s early catalogue. Some Japanese creators were interviewed such as Johji Manabe Haruhiko Mikamoto and Yoshiyuki Sadamato (all guests of AnimeCon ‘91), but these were few and far in between. The magazine also began publishing regular articles on Japanese music and a short lived section on non-Japanese animation. Information on RPG material disappeared. The magazine’s format expanded to a standard US magazine size with issue 22 (March/April 1993), but still remained back and white except for the cover. Over the next couple of years the magazine also expanded to 60 pages in length and fine-tuned its regular columns. 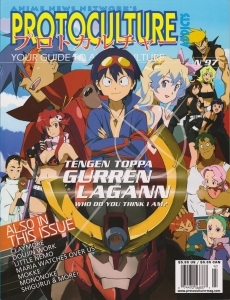 From 1995 to its final days, the magazine was split into six distinct sections; editorial/letters; a news section on anime, live action, manga with a comprehensive list of US release dates; short reviews on anime, manga, live action, model kits and some music; long form in depth “Spotlights” on anime series and films; “Anime World” which included reports on conventions and film festivals, as well as in depth articles on various parts of the anime industry and fandom; and finally “Anime Stories”, which were short write ups on anime, about one or two pages long. Outside of those sections the occasional video game review popped up and model kit news was occasionally published. The gradual change from what was frankly a really unprofessional, scrappy looking fanzine into a polished and really well written professional anime magazine (though not as visually pleasing as say Animerica or Manga Max) is quite amazing. There was also some quite exceptional writing. Of note are parts of the long running series “Anime World”. From 1998 to 2000 the magazine published a sixteen part (yes that’s right, 16 parts) series on censorship called “Anime Under Fire”. It outlined the “for” and “against” arguments, and as you can imagine there’s lots of dodgy and misleading stats for the pro-censorship side. For example, in regards to a link between TV violence and real violence it is noted that the homicide rate in South Africa rose to 130% in 12 years after TV was introduced. No, of course the violence had nothing to do with apartheid! It’s all the fault of television! Correlation does equal causation apparently. In another section, a proponent of censorship actually admits there isn’t any evidence to show that any media causes social unrest or crime, but asks for censorship anyway. In 2000 Protoculture Addicts also published their first and only book; “Anime: A Guide to Japanese Animation (1958 – 1988)”, which was actually an English translation of an Italian book. From 1996 to 2005, the magazine continued on its way with very little in terms of content or layout changing, maybe a few more colour pages added and a gradual increase in pages to 72, but that was about it. Then with issue 82 in 2005, the magazine became a sister publication to AnimeNewsNetwork.com (ANN) with its owner, Christopher Macdonald, taking over as publisher. Many of the site’s staff including Bamboo Dong, Carlo Santos, Therron Martin and Zac Bertschy wrote for the magazine. While I’m not the biggest fan of ANN, I must admit the injection of new staff didn’t make the quality of the magazine suffer, in fact it improved. Only two issues of the magazine came out in 2004, compared with a full six in 2005 when ANN took the reins. With the May 2006 issue, number 88, the magazine finally went full colour, became binded instead of stapled and had a revamp of its layout. A manga preview was also published in every issue. However the end was coming. Issue 97, the July/August 2008 edition, was published, and that became the final issue. In June 2009 Pelletier cited that the collapse of the US anime industry, the Global Financial Crisis as well as personal illness had caused delays in publishing issue 98. The fact was most modern anime fans had no need for magazines; they could get whatever information they needed from the internet. 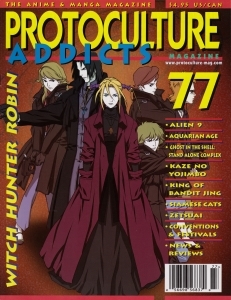 While many online anime retailers had already stopped stocking the magazine a couple years prior, Protoculture Addicts’ website formally announced the cancelation of subscriptions in February 2010. It was later stated that the next issue would be a special 100 page issue entitled “80 Anime You Must Watch!” to be released in Summer 2009, with a second special to be released later in that year. Right through 2010 and a little beyond, the public were constantly promised that issue 98 would be coming. It never arrived. Meanwhile the staff from ANN gave flippant responses to people who questioned them about the status of the magazine on their forums. Eventually the Protoculture Addicts section on ANN’s forums was deleted. Supposedly the magazine still exists per se, in name only. You can buy back issues in ebook format from DriveThruRPG. The magazine’s website still existed recently as 2017, but hadn’t been updated since 2012 and was partly non-functional. A more recent visit to the website confirms it has been finally taken offline. Though Protoculture Addicts had an extremely amateurish, and quite frankly poor beginning, it really turned out to be quite an informative and well written magazine. The last ten issues are fantastic with the content and design coming together really well, though the magazine’s content had been quite good since the mid 1990’s. I suppose regardless of a magazine’s quality, English anime magazines (and print media as a whole) are doomed to die. The current generation doesn’t really give a rat’s about most physical media. I would guess Protoculture Addicts’ incredibly sporadic publishing schedule during its last few years also helped them reach their eventual fate. In some years as little as two issues out the promised six were actually published. I can’t imagine advertisers or subscribers were happy about that. Even though I have pretty much dumped printed media as a whole, there’s a part of me that feels that we have lost something important with the demise of these magazines.